Our 72 Hour Bags are done. Are you feeling better about your resilience in the event of an emergency? Just having three days worth of basic essentials makes you a preparedness superstar compared to most Americans. Today we’re going to start putting all our important emergency and home information in one spot. When we’re done, you are going to have all the information you need to manage day-to-day stuff, minor emergencies or major ones. There’s a couple ways to do this. I prefer the “Family Reference Binder” approach. Hard Copy – I literally don’t know my daughter’s phone number. She’s in my phone as “Daughter” and I push a picture of her face if I want to text or call her. This isn’t like the old days when you had to memorize 10 digits for every person you called on a regular basis. Imagine your phone is destroyed or all the contacts became unavailable because of an emergency. Some neighbor says you can borrow his working phone to text your kid – would you even know what phone number to punch in? Hard copy still has a place. Universal Reference Tool – A binder is easy for anyone to use, to find exactly what they need – including caregivers, grandparents, or babysitters who would not have access to your digital files. We have handed our binder to trusted friends and family in more situations that I can count, confident that if a question comes up, they will be able to find the answer. Not Dependant on Electricity – In an emergency, don’t waste precious time or phone battery trying to look up basic household contacts. Easy to update – Just update and reprint one page at a time as information changes or children grow. 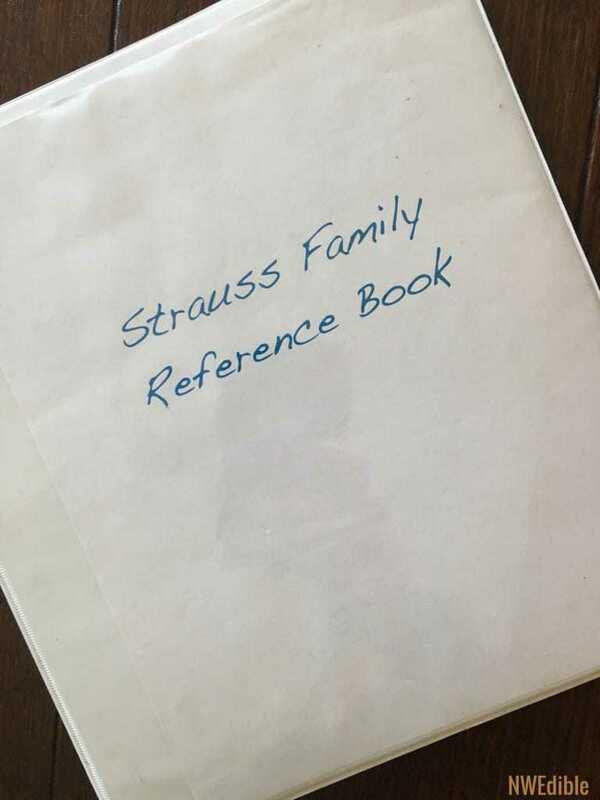 I made my first Family Reference Binder about 10 years ago. It lives in my kitchen “junk drawer.” I’ve added on and revised it many times since then. It’s consistently one of the most useful tools in my house, and the time I initially spent putting it together has been repaid many times over in fast access to important information and peace of mind. When I was outside chatting with neighbors and the street started to smell strongly of rotten egg, I grabbed my binder, flipped to the contact info for “Gas Company” and had a representative out to check the source of the gas leak in just a few minutes. When babysitters have watched the kids, we’ve pointed them to the relevant pages with our full address and directions to our house, just in case the babysitter has to call 911. When we run family evacuation drills, we review the map in the binder with our kids that shows our family meeting places. 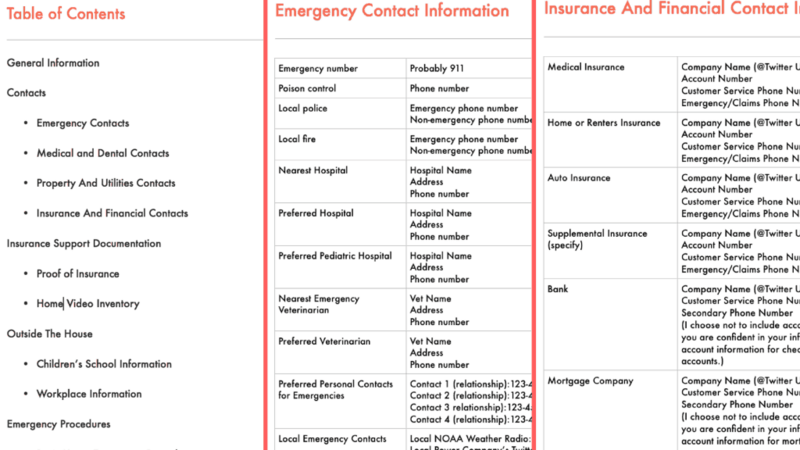 If there’s a local emergency – like an earthquake – our Family Reference Binder has our out-of-town emergency contacts. If we need to evacuate quickly, it has the names of several hotels. When my son woke up on Thursday, covered in blister sores, I shouted at my husband to call the pediatrician and get an appointment today while I bandaged my poor boy up. Homebrew Husband didn’t have to waste any time looking up the contact info for our pediatrician and was able to book a speedy appointment. The Family Reference Binder, in other words, isn’t just for emergencies. It’s a way of putting all the crap that lives only in Mom or Dad’s head down on paper. It’s a way to avoid hunting through the To Be Filed folder if you need a utility account number. It’s a record of how the household functions, plus the information you’ll need to get it back to functioning if an emergency does happen. As with the 72-Hour Bags, I will be presenting a framework for emergency readiness that works for me and my family. Please feel free to adjust the framework or the specific information to best suit your family needs and situation. A flash drive containing your video or photo inventory of your house and all possessions for future insurance claims. In our next article, we’ll cover how to develop emergency-specific plans for your household, and we’ll finish up our binder by adding all our emergency procedures and (if you want) family vital documents. If I tried to put all this information in one post it would take forever to read and get super overwhelming. Let’s get started on information preparedness with our Family Reference Binder. Are you a Patron of NWEdible? All Patrons in good standing have access to a free, downloadable copy of my Family Reference Binder framework. Download in Word, type in the information that is relevant to you and your family, and print out for an easy way to complete this challenge. Patrons, just go to this Patron post to access the download. Not a Patron but interested in joining? Patrons get huge amounts of exclusive bonus content while while directly supporting stuff like this Preparedness 101 Series. Several local emergency contacts, including neighbors, family, etc. 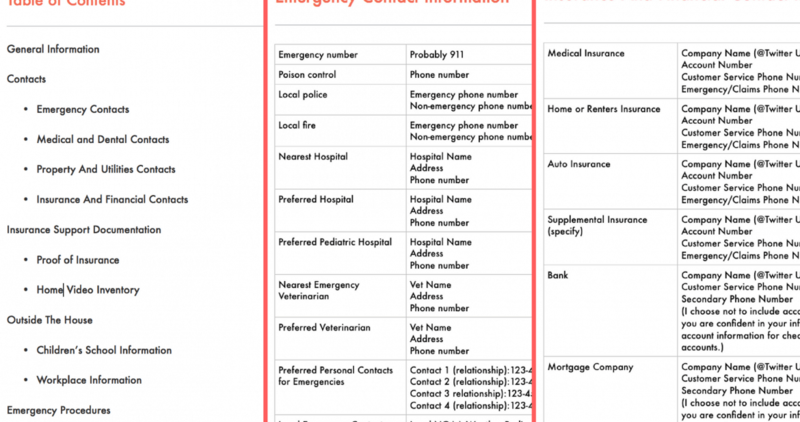 Several Personal Contacts for Emergencies – repeat or expand from Page 1. Local Emergency Contacts – Local NOAA Weather Radio call sign and frequency, Local Power Company’s Twitter username, Local Gas Company’s Twitter username, Your nearest city’s Emergency Information Twitter username, etc. From one of my amazing Patrons: Here’s the link to find your local NOAA Weather Radio station. Trash/Recycling/Yard Waste – Company Name, Days for trash pickup, Account Number, Customer Service Phone Number, Emergency Phone Number if relevant, Twitter Username. Bank – Company Name, Customer Service Phone Number, Local/Secondary Phone Number, Twitter Username. I choose not to include account information for financial contacts. If you are confident in your information security, you can include account information for checking, savings and other financial accounts. Credit Cards – Company Name, Customer Service Phone Number, Local/Secondary Phone Number, Twitter Username. I choose not to include account information for financial contacts. If you are confident in your information security, you can include account information for credit cards accounts. Next we’re going to take an inventory of all our crap. This is one of the most important things you can do to make it easier to get back to normal after an emergency. When a fire, flood, hurricane or even a simple break-in compromises your home, you’ll want this home inventory for insurance claims. The fastest way to take a home inventory is visually. Walk through and around your home with a camera. Record a video or take multiple pictures of each room and the contents. If you are video recording, move and pan very slowly (much more slowly than you think you should). Pause near any particularly valuable or unique items. Get clear frames of any serial numbers, model numbers, or other identifying features of items that are valuable or unique. Narrate as you go, identifying the items in frame to make it clear where you are in the home and what items you are filming. Start a new video with each room or section of your home, to make your videos easier to organize later. If you are taking still photos, start with several overview shots of each room, then methodically take photos of each region in the room (for example, stand in the middle of the room and take one photo towards each wall). Finally, take close up shots of specific important, unique, or expensive items. Get photos of any serial numbers, model numbers, or other identifying features of items that are valuable or unique. Upload all the videos or photos to your computer. Name each video with the room name and date; organize photos into files named with the appropriate room and date. If desired, encrypt your files. Save one copy of your home inventory files on your computer. Save another copy off your computer somewhere safe – in secure cloud storage, on an external hard drive, or give a copy of these files to your super organized sister to hold for you. Now, move a copy of your home inventory files onto a flash drive. Label your flash drive something like “Ins. Inv ’17.” Place the flash drive in a heavy duty ziptop plastic bag or vacuum seal the flash drive to protect it from moisture. Keep this flash drive in your family reference binder. School Administrative District – School District Administrative Address, Administrative Main Phone Number, Emergency Phone Number, After Hours Phone Number. Additional Activities – Extracurricular Activity, Company or Organization Name, Address of Activity, Main Phone Number, Additional Phone Number, Twitter Username, Email, Website if relevant. As you put this together, look into what emergency procedures your child’s school has in place. Most school districts have robust emergency procedures, but do you know what they are? Where would you meet up with your child in the event of a natural disaster like an earthquake? We’ll talk more about this in the next article, but if you can think ahead about Evacuation and Meetup information for places your child would be when they aren’t with you, you’ll be ahead of the game. You may want to consider getting emergency ID bracelets for your children, particularly younger kids who may not be able to convey their personal information to a trusted adult in the event of an emergency. Typical commute route and departure time, bus number, train line, etc. As with the last section on children’s schools, look into what the emergency procedures are at your and/or your partner’s workplace. Is there a standard evacuation place? What resources and plans does your workplace have in the event of an emergency? We’ll talk more about this in the next article, but if you can think ahead about Evacuation and Meetup information for places where family members – including older teen and young adult children – work, you’ll be in a better position to tackle the next challenge. Keep it simple. A 1/2-inch or 1-inch binder is plenty of room. Make a Word doc, type all this stuff out (or modify my framework for your own needs) and hole punch. If you aren’t very organized with things like bills and account information, it will take you a bit longer to pull all this info into one place. Don’t give up! If you’re naturally a little more haphazard with filing and paperwork, this tool will actually be more useful to you than to someone who is naturally extremely tidy and orderly when you are done! If you want, you can add dividers for categories like “Contacts” and “Insurance Support.” It’s nice if you like that kind of look, but it’s not essential. This doesn’t have to be perfect! Your important information in one place (but ugly) is better than no information preparedness at all. Please don’t keep lack of dividers, the perfect binder, or the right font keep you from completing this challenge. Done is better than perfect. Try to complete your home inventory this weekend. If you follow my “video and narrate” approach it shouldn’t take too long. But do be thorough. Again, done is better than perfect – don’t worry if beds aren’t made or your living room is covered in dog hair and toddler toys. That stuff does not matter for this inventory. I hope you never need to look back through those files and videos to make an insurance claim, but if you do – that home inventory will be one of the best gifts of resilience and recovery you’ve ever given yourself. In our next post, we will finish out our Family Reference Binder by developing procedures to keep us calm and focused in an emergency. I can attest to the value of an inventory video. Our house burned down in 2004 and I had to write down *every single* item we owned for our insurance claim. I did it all via visual memory, imagining walking through the house room by room, writing down what I remembered. Details were important especially on electronics and valuables like jewelry. It took probably 30 pages and two weeks total time (among all the other tasks at hand when your house burns down). Would have been awesome to have had a video in the cloud or at my sister’s! I’m so sorry you went through that. Thank you for sharing this personal example of why these things are good to get done, even if we think it’ll never happen to us. Preparing for recovery is a huge part of preparedness. I still have to get the the things scanned, but I got everything else done! I feel so much better for having it all organized. Thank you for breaking this process into bite-sized chunks that I can actually get done. You finally me to do this, and I’ve been meaning to make one of these things for like three years! Also, a couple of things that occurred to me while I was filling this out: renters will want a spot for contact info for their landlord and/or property management co. I also added my car mechanic (with address for towing!) and my AAA info — my son once had to call me from the side of the road for both of these pieces of info when he was in a minor accident and couldn’t find the AAA card. It would have been good to have it all handy when he called. Oh, thanks! Great point – I love those additions, and for sure, adjust contacts for individual situations. Well done! I know what you mean – this isn’t the most exciting aspect of preparedness, but hands down having all this info in one place has been more useful to me in more situations than any other aspect of my preps. Day to day AND in an emergency, I think the effort will pay off for you, too. This is helpful and useful information, Erica. I really love the fact that you broke down it to steps. We already have a binder prepared at home, but when I saw this article I think we might have to add some additional information to ours. We haven’t documented our inventory and haven’t recorded an inventory video. We’ll start to record one and update our reference binder. Many thanks!